When people find out your a sailor the first thing they ask is what kind of boat do you have. I know here we go should I tell them its a catamaran and see that blank look in their eyes then go into another 10 minute explanation. The simple answer is I sail a Hobie Cat and instantly people know what type of boat you have. Why? I think it’s those colorful sails found on the vintage Hobie 16’s with all the crazy colors & patterns with names like Cat Fever and Tequila Sunrise that fascinated all of us! Times have changed and the sails have changed too with the advances in sail materials the fun patterns are not around anymore. That’s life right? Wrong! I know of a place that will make you just about any style Hobie 16 sail you want! That’s right how about a brand new set of sails for your boat with that look that changed the sailing world! 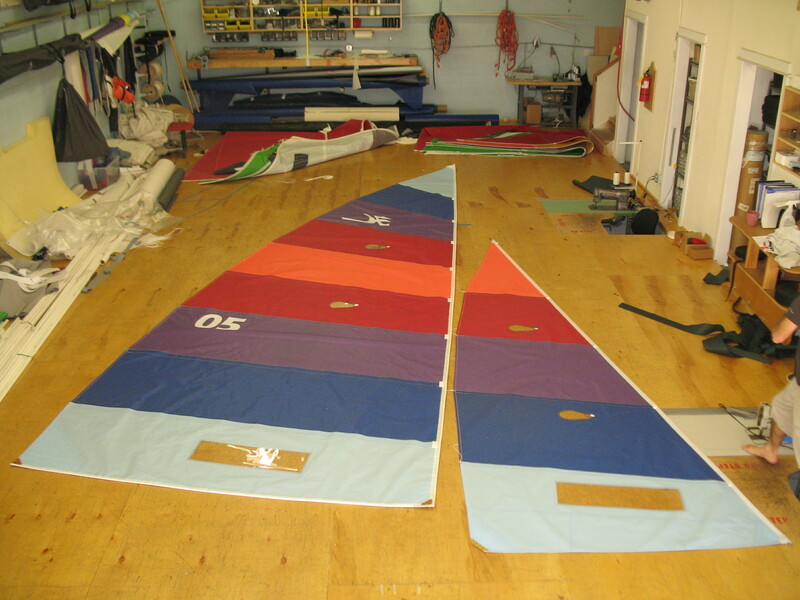 SLO Sails & Canvas is the place to get your retro pattern Hobie 16 sails. I have used SLO in the past and there customer service was great they really stand behind the products they sell. I called them to get the 411 on these sails and again these guys deliver below is the info they sent me with pictures of some sails they have completed. Thanks SLO! Attached you will find quite a few pictures showing the build process and quite a few more showing the finished products and some of their details. 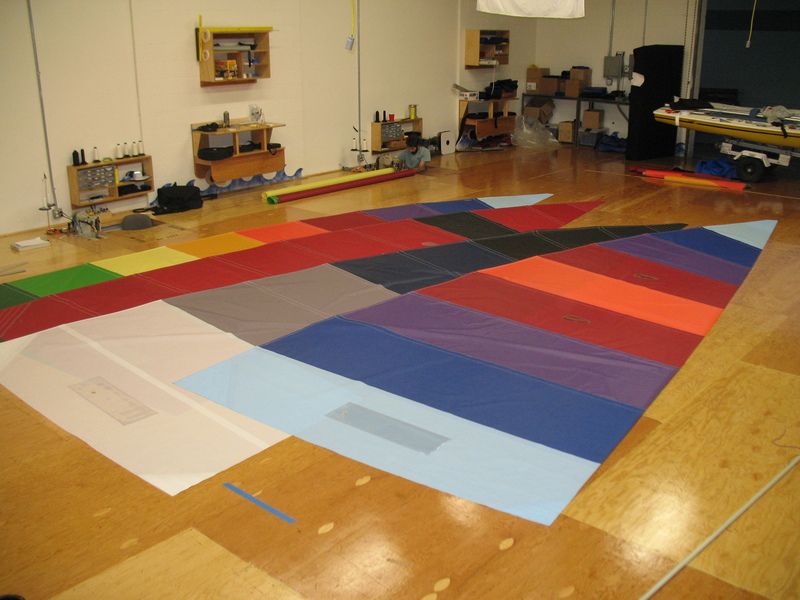 We are building these sails in just about any color and combination that we can get our hands on. Unfortunately, we can’t copy some of the original Hobie patterns from the 70’s as they are no longer producing some of the colors such as brown or the multistriped cloth. Customers are free to choose most any of these designs (with the caveats above) or choose their own design. These designs can be created on our website with our color customizer application. 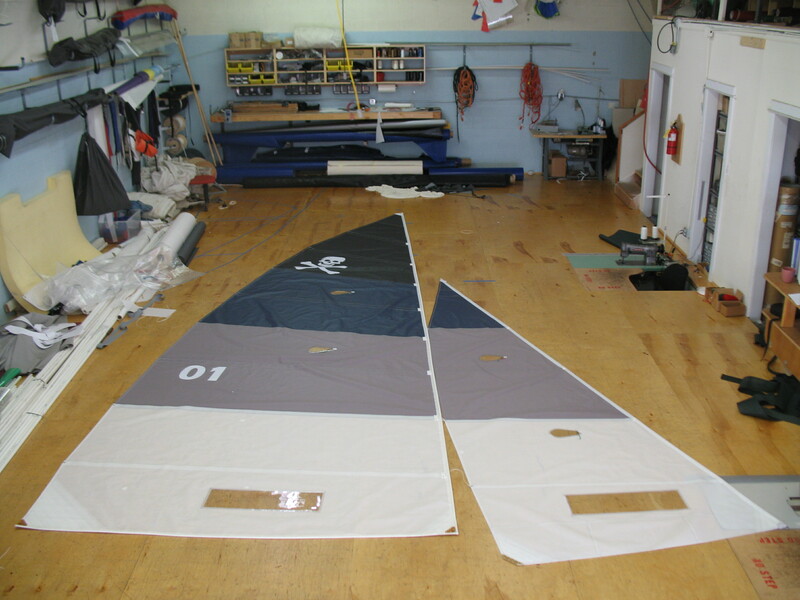 Custom designs are no more expensive than any of our other color sails. 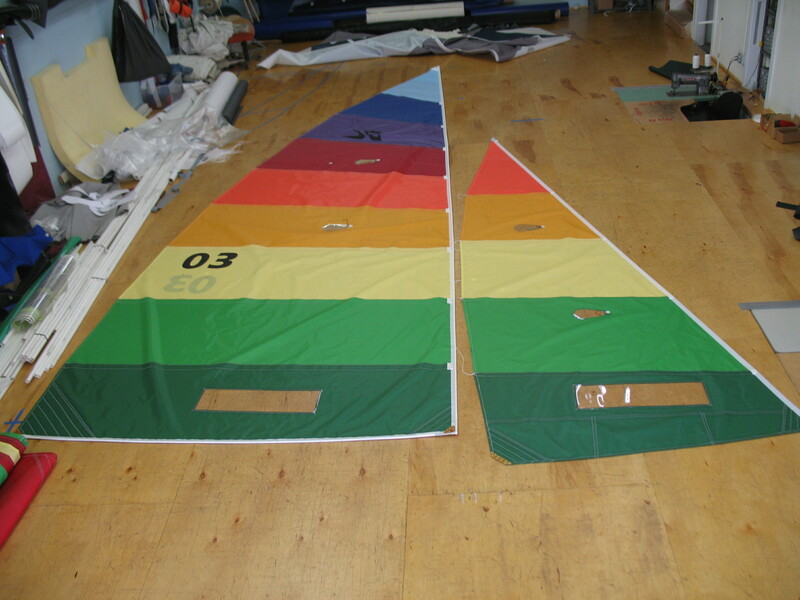 Great care was taken with the design of our sails in order to match the original product as closely as possible. This allows the customer to use their stock Hobie battens, which can be a considerable cost savings. We do offer full batten sets for the main and jib from RBS batten systems which are some of the best tapered battens on the market. The viewing and telltale windows are also located similar to the stock Hobie sails. Our jibs all have multi hole clew plates like the later Hobie sails so the leech can be easily adjusted. All of our sails come with telltales; batten ties, and logos and numbers in the customer’s choice of black, red, blue or white. Mainsails and sail sets come with rolled sail bags. Please let us know if there is anything else we can help you with or if you have any questions about our products. We are also carrying complete line kits for the Hobies as well. ~ by Floyd on February 25, 2011. Sorry to hear that happened they sent me a tramp for a 5.5 Nacra that didnt fit right I called Karl and he had me another in two days same thing happened to another guy I sail with and again 2 days later a new tramp arrived. My freind just sent his Inter 17 tramp in and SLO made him a new one from it and send it back fast and its a nice tramp. yes, i have heard from many people they were very satisfied with their resutls. I am glad no one had my results. So i guess giving him 4 months to return the tramp was enough…. Sorry to hear you are still dealing with that man. Its in bad taste for people who were not directly involved to call someone names. I’ve had good luck with them but I’ve had the same type of thing happen with other sellers who everyone else liked but I got a raw deal. Sometimes good people make mistakes it’s over and your entitled to your opinion but don’t let it eat you up man say forget it and move on life’s to short. Thanks Floyd. I have moved on and It doesn’t eat me up at all.. but every time i read someone ask a question about his company, i feel i must inform them about my experience. I also have found more people with similar experiences.